WASHINGTON (Fortune) — John McCain has tried to paint his Democratic opponent as a big-spending, big-taxing liberal. How do you condemn Obama as a Big-Government Liberal when your fellow Republicans in the White House are busily nationalizing portions of the country’s biggest banks, bailing out the world’s largest insurer, taking over semi-private mortgage securities firms – and, along the way, putting several hundred billion dollars in taxpayer money at risk? When your own plan, borrowed from Hillary Clinton, commands the Treasury Department to spend $300 billion to buy up home mortgages from people who can’t make their payments? So in Wednesday’s debate, McCain shifted tactics to accuse Obama of being one of those liberals eager to take your hard-earned wealth and redistribute it to those less hard working or less fortunate. And that’s when we got to meet Joe the Plumber, whose name came up 26 times in the course of 90 minutes. Joe is Joe Wurzelbacher, a Toledo, Ohio plumber who showed up at an Obama rally to challenge the Democrat’s tax policies. Wurzelbacher wants to buy the business where he works but says he’s worried that, if the company is successful, he’ll face higher taxes. Obama has said that he’ll cut taxes for those making under $250,000 but that people making more than that would see an increase. Judging by McCain’s Cheshire grin, and repeated replays of Joe’s story (later in the debate he said Obama’s health plan would penalize Joe; Obama said it wouldn’t), the Arizona senator clearly thought this could be his “game-changing” moment – that the discovery of a video-clip capturing Obama’s exchange with Joe would reset a presidential race that seems headed toward a solid Obama victory. But it’s a tall order to ask Joe to turn around the McCain campaign with only 19 days to go. The Real Clear Politics average shows Obama leading by seven points nationally. He has a wide lead in improbable places like Virginia, and is more narrowly ahead in important battlegrounds like Florida and Ohio. Most tellingly, perhaps, is this week’s New York Times/CBS poll, which found that roughly 7 in 10 voters think Obama has the right kind of “temperament and personality” to be president, while just over half said that of McCain. (CNN) — Joe Biden sounded skeptical of “Joe the Plumber” Wurzelbacher’s working-class credentials Thursday. ABC News’ Chris Bury is outside Toledo, near the home of Samuel Joseph Wurzelbacher, aka “Joe the Plumber,” and reports that Wurzelbacher — such a key part of Sen. John McCain’s critique of Sen. Barack Obama’s economic proposals — acknowledged that he wants to purchase the plumbing business for $250-280,000, not that he would net that much in profits. He would make much less, he said. Which would seem to indicate that he would be eligible for an Obama tax cut, not that he would be subject to the tax increase from 36% to 39% Obama would impose on those making more than $200,000 per person, or $250,000 per family. COLUMBUS, Ohio – Joe the Plumber, America’s most famous tradesman, said Thursday he doesn’t have a license and doesn’t need one. Joe Wurzelbacher, better known as Joe the Plumber, the nickname Republican John McCain bestowed on him during Wednesday’s presidential debate, said he works for a small plumbing company that does residential work. Because he works for someone else, he doesn’t need a license, he said. But the county Wurzelbacher and his employer live in, Lucas County, requires plumbers to have licenses. Neither Wurzelbacher nor his employer are licensed there, said Cheryl Schimming of Lucas County Building Regulations, which handles plumber licenses in parts of the county outside Toledo. Wurzelbacher said Obama’s tax plan wouldn’t affect him right now, because he doesn’t make $250,000. “But I hope someday I’ll make that,” he said. As he leaned against the Dodge Durango SUV parked in his driveway Thursday morning, Wurzelbacher indicated to reporters who crowded around that he was a conservative, a fan of the military and McCain. He said meeting McCain would be an honor but said he hadn’t been contacted by the Republican campaign. Oct. 16 (Bloomberg) — “Joe the plumber,” the Toledo, Ohio, man whose complaints about Barack Obama’s tax plan were featured in the final presidential debate, owes the state of Ohio almost $1,200 in back income taxes. According to records on file with the Lucas County Court of Common Pleas, the state filed a tax lien against Samuel J. Wurzelbacher for $1,182.98 on Jan. 26, 2007, that is still active. Do Todd and Sarah Palin Know Doug Wurzelbacher Of Wasilla, Alaska? It would appear so . . . I mean it is a “small town” with small town values. Is Doug Wurzelbacher related to Joe Wurzelbacher AKA “Plumber Joe”? According to the census, there are less than 175 Wurzelbachers in the country, and one of them lived in… WASILLA, ALASKA! and was involved in competitive snow racing. Competitive snow racing? Could he have possibly crossed paths with Todd Palin, who is a competitive snowmachine racer? I don’t know about you, kids, but I’m suspicious. Especially since I saw this in the back Joe the Plumber’s Dodge Durango…. You managed to completely unclog Joe the Plumber’s full-of-$hit pipes. When McCain mentioned him the second time, I immediately thought, “Uh oh, Joe’s some kind of GOP hail mary pass that just bounced off the receiver’s helmet and flew up into the stands. I guess McCain’s too old and ignorant to realize how easy it is to research phonies like Joe the P on the Internets. And he needs to sue his campaign team for gross malpractice after this latest stunt. stunt is the perfect word. i don’t believe for a minute that the capt u team didn’t know about joe the plumber in advance. when you listen to the guy, he ticks off every capt u talking point. he is never, ever critical of capt u, only obama. pure and simple, he was a plant. i don’t know if the capt u team planted him. i am thinking that it was someone on the local rethug level who was being directed by someone on the team. I am certain he was bought and paid for by the McCain team. How the fu¢k else would McCain be so intimately acquainted with the story he told Obama on tape? Does anyone believe McCain has time to personally review every taped conversation Obama has on the campaign trail, just in case someone says something he can use against Obama? And Joe was totally full of $hit with the story he told Obama. He’s a proven tax evader, he’s not a plumber and he’s a non-voter who just recently became registered Republican and voted in his first primary. Even the die-hard GOP pundits are like, jeeze, we can’t even pretend to be falling for this bull$hit. 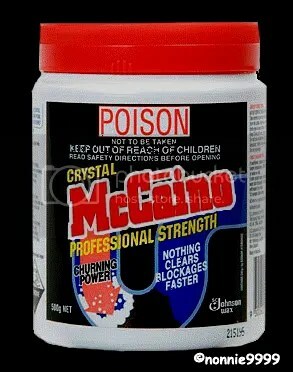 McCain has proven once and for all he’s a slimeball who’ll fu¢k a snake to win. exactly. what are the chances that anyone actually would see that particular conversation, let alone understand what he said his last name was, unless they tracked him down and asked him him story? i heard an interview on the radio that he had given one of the tv morning shows. it sounded like a list of gop talking points, and he recited them without hesitation. not even a pause between points. he was undoubtedly prepared–much better than princess sarah had been for the debates. The media sure picked up the ball and ran full speed ahead with this one, I am glad it turned into such a mess for both of them. Both are pathetic choices for America anyway. do you have a palm tree in view from your house? 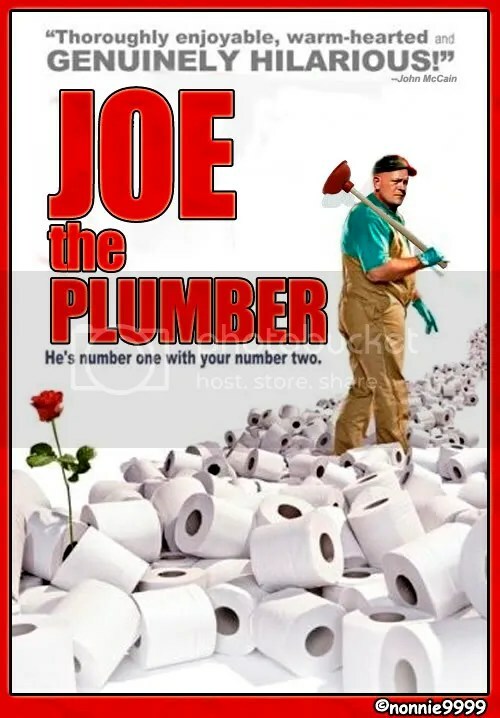 joe the plumber is so bogus! is the rose for ? the media went nuts like they always do. next time they pick up the ball and run full speed ahead, i hope they run into a tree or something. they don’t even have enough integrity to be embarrassed. i miss you! how is the sand and surf? are the kids having fun? everyone getting nice and tan? there are plenty of palm trees around here. you can’t spit without hitting one. daughter is a bit puny tonight – cough and puke style. i have her propped up in a couple of the chairs, so i hope that helps. son and husband are in haleaka crater in a cabin tonight, and we’ll pick them up tomorrow after lunch. the weather is very lovely here, and we shall visit the beach in the morning. mothers never get vacations. they always wind up cleaning up someone’s puke. 🙄 i hope the little one feels all better tomorrow and that you have a great time. Ambassador Vreenak’s verdict on Joe the Plumber. The Toledo Better Business Bureau says Joe’s plumbing company stinks! Does anyone do any research? Does journalism now have a module on being a lemming? i guess i was wrong. the rose is there to try to offset the smell of joe’s plumbing company, not the smell of the toilet! OMG, Nonnie, you’re kidding me. I was just watching “Mean Green Mother” over on You Tube. I’m the biggest Four Tops fan ever. $hit! i wish i was kidding, jeb. 😦 i loved the 4 tops, too. OH I adore that graphic!!! How EVER did you find something so appropriate? You are a genius! Yeah, that whole thing was a setup and a plant. And it is backfiring. Good investigative work! i just think of target words and hope for the best. i am sometimes amazed at how perfect some of the movies i find are. it’s not genius, it’s pure luck. i luck out on finding what other people have found through investigation. Seems to me no one won Wednesday’s debate. “Joe the Plumber,” McBain, and Obama each have their problems. “Joe’s” are largely because McCain put the man on Front Street. All because he showed up at an Obama rally and asked how the Democrat’s tax plan would affect him. And McCain thought it would knock the wind out of Obama’s sails. McCain is suffering because “Joe” isn’t squeaky clean and his campaign failed to do due diligence before the candidate made “Joe” a national celebrity. Too bad he’s more like Brittany Spears than Dianne Sawyer. Obama’s fallout from the debate seems to be less publicized. He, once again, lied about his involvement with the radical group ACORN. Clinging to the single motor voter court case, Obama doesn’t disclose his lectures to ACORN leadership, the organization’s involvement in his early political career, or the fact his campaign this year gave $80,000 directly to ACORN and another $800,000 to a related organization. So, the deal is “Joe the Plumber,” Obama, and McCain each have issues that need consideration. Would you rather a president that lies or one that doesn’t consult his team? acorn is an organization of poor and middle-class people who join together to try to make their lives better. how do i know this? years ago, i was a member and vice president of one of the local chapters. was it a radical organization when john mccain gave the headliner speech at an acorn event in 2006? please spare me your fox news talking points. not just tp, but can you imagine how much money we will have to spend on deodorizers to get the stink out of the white house (g_d willing that we get obama in there). i haven’t thought about the fake tp shortage in years! that was so hilarious! It’s not Joe the plumber’s profit that is taxed, it’s his income. Income for small businesses can easily reach more that $250,000 and that is income to the owner. Under Obama’s plan most small business owner’s will face higher income taxes. I take it most of you are not small business owners. what are you talking about? businesses are taxed on their income minus their expenses. that’s also known as profit. the overwhelming majority of small businesses will not pay more under obama’s plan. The comments by Jed and Nonnie “0” are scary. To think these idiots are allowed to vote. They cannot be for real. They are the most misogynistic and racist knuckleheads going. They label people what they are. They don’t have a job and that is why they are Obamazombies. They want government to fix all. I hate to break it to you. The gov cannot fix a thing. Obamee is going to raise taxes on corporations and the corporations are going to raise the cost of their goods and services and lay off more people. You will get more gov handouts and everything will cost more. You will be right back where you started from. Stupid and lazy. everyone seems to forget that Mcsame is a millionare by marring a very rich person . His intrest is in protecting his wealth . I also have been a small bussiness owner for 19 years and payed alot of taxes with no benefit to my health or wealth. you make very good points, and i agree with you. it’s time for people to start voting for their own interests instead of the interests of millionaires like capt underpants, cheney, and chimpy.